The Pilgrims had left England in order to freely practice their faith in the Netherlands. But then they decided to make their way to the “New World,” where they felt they would have a better opportunity to preserve their religious identity and customs. From England they left on two ships, the Mayflower and the Speedwell. Approximately three hundred miles out the Speedwell began to leak, so both ships turned back and docked in Plymouth, England! Some of the ships’ passengers, apparently exasperated, decided to call it quits and stayed in England. 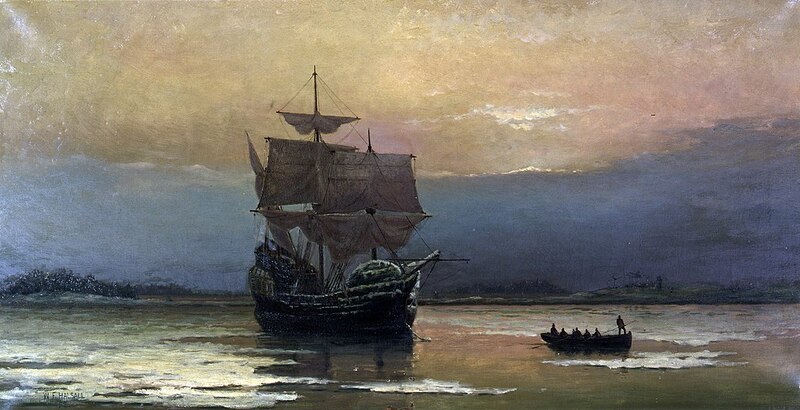 Everyone else boarded the Mayflower on one of the most historic journeys ever taken, arriving in Cape Cod Bay in 1620! It was these Pilgrims who celebrated the first “Thanksgiving” in November of 1621 with the Wampanoag Indians in gratitude for the harvest. The Pilgrims’ difficult journey to America teaches us a deep spiritual lesson. We are all travelers here on earth journeying to the eternal shores of Heaven. Whatever obstacles we may encounter, however difficult they may be, we cannot let them prevent us from “advancing towards our destination” – Heaven. “All the masters of the spiritual life agree in this maxim, that not to advance is to fall back” (Father Lallemant). Thus, we must continue to move forward, like a traveler, not stopping until we have reached the end of our journey and are “safely home” in the Father’s house. Father Garrigou-Lagrange adds this observation regarding our growth in charity: “…the Christian on earth is a traveler, viator, who is advancing spiritually toward God. His spiritual advancement is made by more and more perfect acts of love, “steps of love,” as St. Gregory says. We must conclude from this that charity on earth can and should always increase, otherwise the Christian would cease in a sense to be a viator; he would stop before reaching the end of his journey.” “I press on toward the goal to win the prize of God’s heavenly calling in Christ Jesus” (Phil. 3:14). The Pilgrims journeyed to America yearning for religious freedom. These Pilgrims endured tremendous hardships and significant risks in order to freely practice their faith. They teach us an incredibly important lesson about the importance of religious liberty, and our concurrent obligations to protect such a treasured right. In 1791, just over a 150 years after the Pilgrims made their journey, and about three years after the ratification of the United States Constitution, the Bill of Rights was enshrined in that same Constitution. Of the ten amendments constituting the Bill of Rights, the 1st Amendment guarantees the “free exercise” of religion, and prevents the government from establishing any sort of religion. The right to freely practice one’s religion is therefore a hallmark right of American democracy. The Pilgrims, who journeyed to America in search of religious freedom, remind us that the right to practice our Catholic faith cannot simply be taken for granted. Many Christians in the United States have experienced an erosion of their religious liberties in recent years, this as emerging secular ideologies gain momentum in the culture and seek to impose their version of rightness on Christians. Many Christians have essentially lost their right – in the public square – to express their faith beliefs on important moral issues for fear of reprisal, ridicule and even losing their jobs. We have seen, as well, various attempts to force Christians to do things that fundamentally violate their religious beliefs. Finally, there is a growing concern about censorship of conservative viewpoints – including Christian ones – on social media. As we celebrate Thanksgiving this year let us say a prayer of gratitude for our religious liberties. Let us learn from the Pilgrims that we may have to face hardships in order to protect our precious Catholic faith and our Constitutional rights. May God give us the courage and perseverance to do so as we advance the Kingdom of God. WISHING YOU A BLESSED AND HAPPY THANKSGIVING WHEREVER YOU MAY BE! References: The historical facts regarding the Pilgrims are from various internet sources.